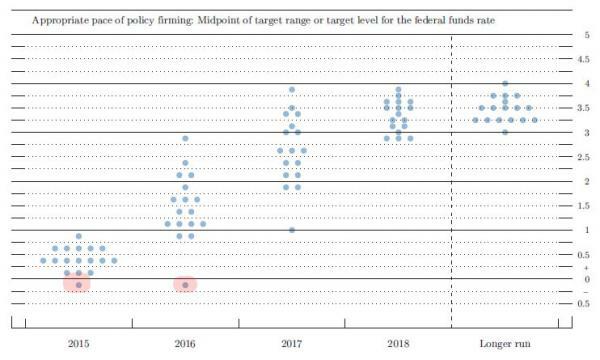 but the author is ultimately irrelevant: what is very relevant is the "inception" of NIRP in the heads of the FOMC members, which came at a time just when everyone was supposedly gearing up to boost rates by a meager 25 bps, further raising questions if the US economy is already in recession (spoiler alert: yes). Of course, this should come as no surprise to our readers: just in January we wrote "Get Ready For Negative Interest Rates In The US", but for the Fed to admit this possibility just when it was widely expected to at least signal a rebound in the economy with the tiniest of rate hikes, or at worst a hawkish statement, was truly a shock. The proverbial "we did not seriously consider it today" fluff. Remember when the SNB promised the Euro-Franc peg was safe and sound "today", and the very next day it crushed countless FX traders who were long the EURCHF? Kinda like that. And there you have it: not if but when the inevitable inventory accumulation spills over and results in the next recession, we now know the simple choice that is facing the Fed: QE 4 (or 10 if the Fed goes "Windows") or NIRP. As for hiking rates, well we leave it to Ben Bernanke who said it best earlier this year: "No Rate Normalization During My Lifetime"